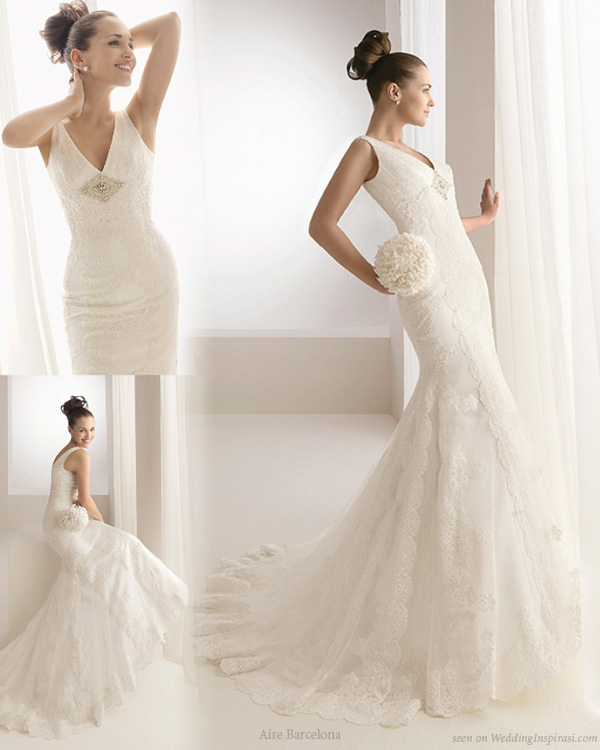 These gorgeous gowns are from Aire Barcelona’s 2010 collection. 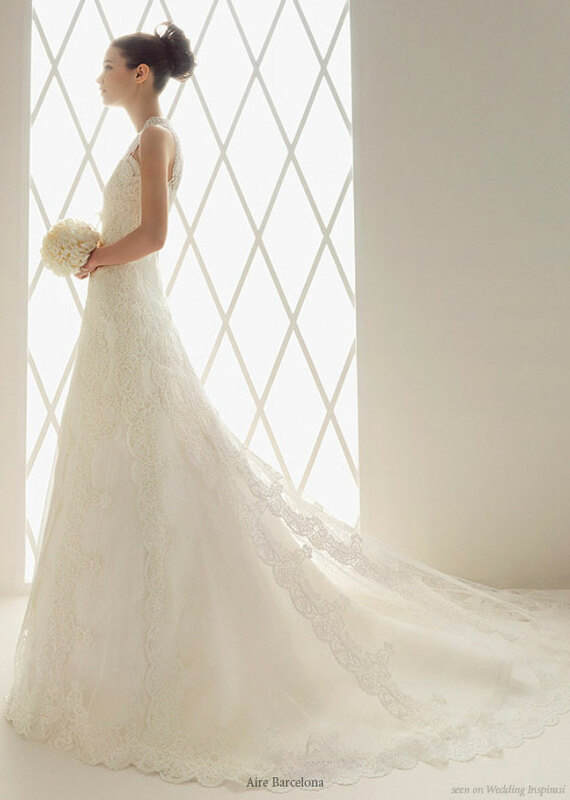 Lovely use of light and airy fabric (like silk chiffon) and romantic laces. Top: Bolonia – strapless with drop waist; left: Bobbie – off-shoulder delicate ruffle dress with waist detail; right: Burbuja – unique layered A-line silhouette. Stunning ruffle gown with fitted ruched bodice, Burgos. Multiple views of the elegant v-neck gown with thick straps, Birmania. Two outstanding strapless dresses. Left: Bristol: Diagonal ruffling and underbust detail; right: Brasil with a cinched drop waist and a flamenco-esque crinkle crepe skirt. Speaking of outstanding strapless gowns... Take a look at this Bolsena dress. Left: Byron: interesting texture on this strapless gown; right: Balboa: layered dress reminiscent of a topographical map (looks better than it sounds). Detail of back and train of the sleek fit and flare gown, Biel. The Spanish bridal house also has adorable short sleeve bolero jackets like these two - puff sleeve organza with nehru collar (worn over Bonn) and a very pretty cap sleeved lace one (worn with Bolonia).The latter looks spot-on pretty for a solemnization ceremony at the ROM office or at a quaint tea party in the company of close family and friends. OMG! The 3/4 sleeve large floral lace one on the left (worn on top of Begonia dress). So, so beautiful! Right: elegant long sleeve lace jacket paired with Bella gown. And more cover up options for church ceremonies or modest brides... A high collar sleeveless one (worn with Balada) and an an off-shoulder one lined with pretty ruffling (worn with Byron). Fun fact: Spanish actress/model Paula Echevarría (right below) is the exclusive model for the 2010 Aire Barcelona bridal collection. Here's here modeling a super gorgeous wedding dress called Babilonia. Love the jewel-encrusted straps. O.o Beirut gown - A lovely vision of beauty. Yes I do believe in love at first sight. 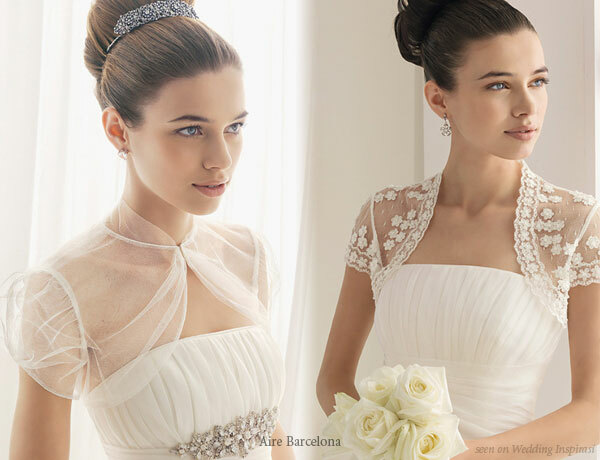 "Aire Barcelona thinks of you, creating gowns full of magic to ensure you're at your most beautiful on your great day" Indeed. Indeed. 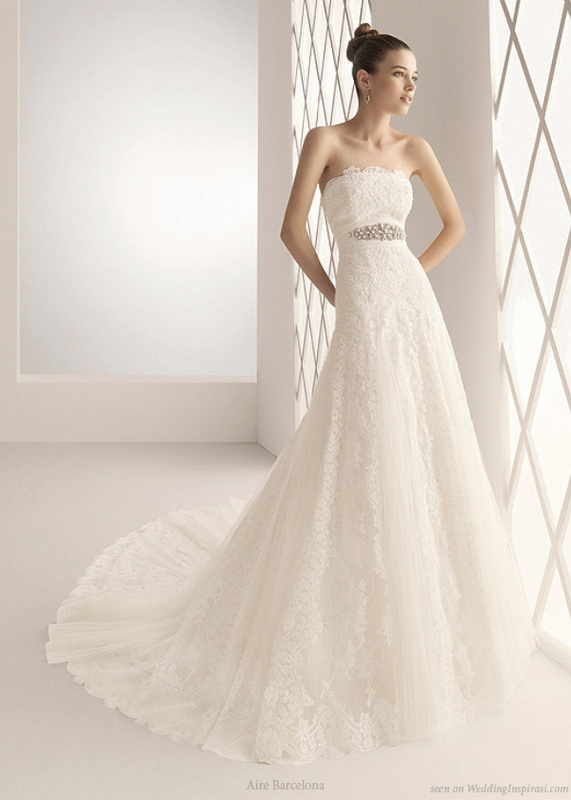 See the entire wedding dress collection at Aire Collection website.